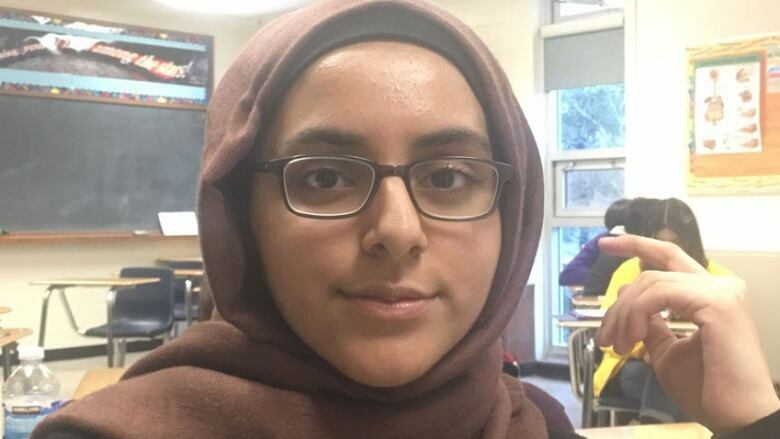 Aminah Khan, 16, is one of 10 finalists in the Grades 10 to 12 category of The First Page student writing challenge. Tagged by Aminah Khan is one of 10 stories shortlisted for The First Page student writing competition in the Grades 10 to 12 category. Students across Canada wrote the first page of a novel set 150 years in the future, imagining how a current-day trend or issue has played out. Nearly 2,400 students submitted their stories. Khan, a student at Vincent Massey Secondary School in Windsor, Ont., tackles artificial intelligence and machinery replacing human workers in Tagged. My eyes glared a hole on the ceramic floor and I could see my reflection glare back. I analyzed my profile. My blonde locks were knotted and likely drenched in sweat which accommodated my face and neck. A bead trailed to my left eye and I scrunched them tight to ease the sting. I bowed my head down and noted the state of my polo. I scowled in disgust. The redhead to my left let out a silent sob and quickly bit her lips in hopes to hush her cracked whimpers. Her appearance corresponded to mine. "Wszystko będzie dobrze, my dear." Redhead's supposed beau crooned in comfort, in a language I could not identify. He was to her left, dirty and cuffed like the rest of us. "Oh Ana," he hushed. He shuffled his knees as close as he possibly could to Redhead — Ana and placed his head on top of hers. My eyes shifted away and I raised my aching neck up, looking to see the row of nine heads. I analyzed each one. Some were bowed down and still, and others shaking in misery. The want in this room to escape was lucid. The want to not be disposed of. Our beating hearts and strumming minds being replaced by hard-drive machinery and our blood for chemical slick. The want I never thought I'd feel. I swallowed down a bitter chuckle. We all patently contrasted the immaculate room. Our filthy bodies kneeled close, making us explicit. A foul odour circulated our figures, a mix of perfumes, aged sweat and fear mingling with the clean air. It smelled like stale salt with sanitizer and it itched my nose, crawling in as I took a breath. Fighting back the urge to spill my guts to the floor, I tried my best to not panic. Sadly, my urge aroused when the doors opened. All 10 of us went still as it's click bounced against the room. I could hear sharp intakes of breath from the others near me. The thrum in the room came to a silence immediately, lips shut tight but shoulders trembling. The footsteps coming from behind me became coherent, and my eyes snapped shut. Definitely more than two people, and the squeaking of wheels. A cart. My tedious act of oblivion cut short unwillingly. I just knew what was coming for us. CBC Books asked students to give us a glimpse of the great Canadian novel of the year 2168. They wrote the first page of a book set 150 years in the future, with the protagonist facing an issue that's topical today and set the scene for how it's all playing out in a century and a half. Two winning entries — one from the Grades 7 to 9 category and one from the Grades 10 to 12 category — will be chosen by award-winning YA writer Cherie Dimaline, author of The Marrow Thieves. The winner will be announced on CBC Books on Feb. 22, 2019. Both winners will receive a one-year subscription to OwlCrate, which sends fresh boxes of books to young readers across Canada on a monthly basis. In addition, each of the winners' schools will receive 50 YA books. CBC Books's next writing competition for students is the Shakespeare Selfie student writing challenge, which will open in April 2019.